Refactor controller to use the constructor injection. If you are following the default convention means IMovieRepository should be resolved to MovieRepository then you should not care about any other files. 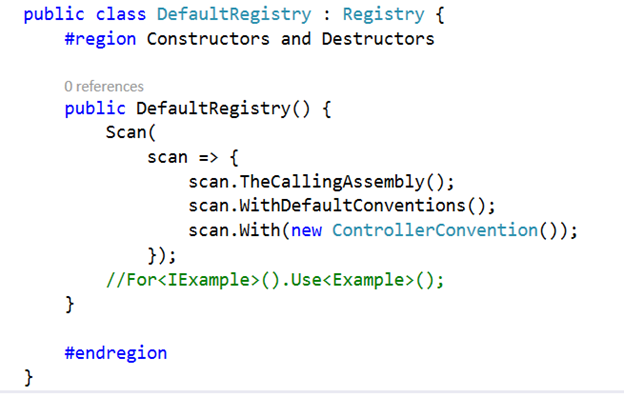 However you can override default behavior in the DefaultRegistry class which is inside DependencyResolution folder. As you notice below that StructureMap is scanning with default convention. As you see that we are explicitly specifying that the scan assembly which contains MovieRepository. In this case MovieRepository is part of another project MvcMovie.Infrastructure.MovieRepository. Other important class is StructuremapMvc which is inside App_Start folder. This is all you need to configure to resolve dependency using StructureMap in the ASP.NET MVC application. Very helpful article, I was stuck on DI with ASP.NET MVC5 with StructureMap.MVC5. Quick look at your article saved my sunday. Great work. Keep helping. God bless you! My application has 3 layer web,Business and service.Web is MVC 5 application.Controller has reference of business layer.My interface and its implementation lies in business layer.I have used the solution you have provided but I am still facing the same issue.Can you please help me with the error.